It is satisfying and heart-stirring to be reading the Bible and have something jump off the page and say, “Here, here, pay attention here!” That’s exactly what happened last week while reading in the Gospel of Matthew. In Matthew 25, Jesus gives the parable about the ten virgins and the oil. Read it if you need refreshing on the details! But verse ten says, “and the door was shut.” When THAT particular door was shut, I believe it was speaking of end times, the church is gone and there are no second chances. Both of these doors, it seems, have no exterior door knobs. Once they are closed, no one else can get in. My dear friend always says as long as there is breath, there is hope! Yes, we are still living in the day of the OPEN DOOR! Please be sure you are on the right side of The Door! Thanks again for your sharing. How. blessed are those who have made the choice to be saved! 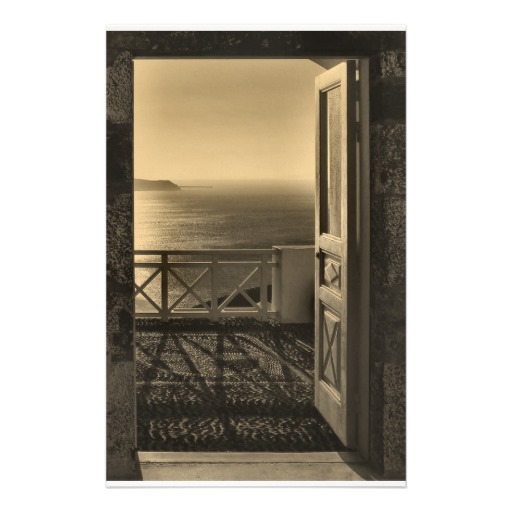 When we talk about doors I always remember the old print of the door in the Revelation — there is no doorknob on the outside only a picture of Jesus knocking. He can’t open the door for us, we must do that but He is the OPEN DOOR! What a wonder that He loved us so much as to make a way. Oh, how I pray for my prodigal children to “come home”……come “into the ark”….where it is safe.